From the writer of ‘Gu Family Book‘ Kang Eun Kyung, comes SBS’s new drama starring Han Suk Kyu, Yoo Yoon Seok and Seo Hyun Jin. The drama revolves around the lives of a medical intern and a residential doctor, that go through immense change because of Teacher Kim. Boo Young Joo was a famous surgeon who suddenly disappeared from the medical field to to lead his life in seclusion. He now goes by the name of Teacher Kim and calls himself the ‘Romantic Doctor’. Teacher Kim, changes the life of Dong Joo and Seo Jung, both of whom became a doctor to win somebody/get acknowledged by somebody. The two learn important values about life and love, through their encounter with Teacher Kim. Though medical dramas come with their own fast-paced story lines and unbelievable twists, this drama takes it to a whole new level. Just in the first episode, they introduce several characters and even set up a story-line and the female lead receives a love confession from the male lead! If that’s not fast, we don’t know what is. First off, the drama is definitely fast-paced, which is very unlike the writer’s plot deliverance in ‘Gu Family Book‘. We already know that there is a lot to expect from the way this story is going to be told. Secondly, the artistic quality of direction in the drama is exceptional. With just the first episode as a basis, the director delivers some heart-warming interactions between Dong Joo and Seo Jung. Such moments, are well-calculated and well-placed moments of human interaction using the bubbling chemistry between Dong Joo and Seo Jung as a catalyst to the story. What entices us about this drama, other than the high expectations we have for the plot, is the cast. Yoo Yoon Seok (who also had a role to play in ‘Gu Family Book‘) has shown a wide variety of talents through his characters. He has burrowed a niche in the industry, for delivering each character with finesse and a bravery of his own. Seo Hyun Jin doesn’t fall behind either. She has several hit dramas such as ‘Another Miss Oh‘, ‘Lets Eat 2‘, ‘The Three Musketeers‘ and ‘Jung Yi, Goddess of Fire‘ in her repertoire. Han Suk Kyu, who plays the formidable Teacher Kim in this drama is more famous for his set of films than his dramas, but that doesn’t mean he lacks skills in either. With movies such as ‘The Prison‘ and ‘The Royal Tailor‘ he has surely displayed his unmatched set of skills, which will be enlightened with this role. 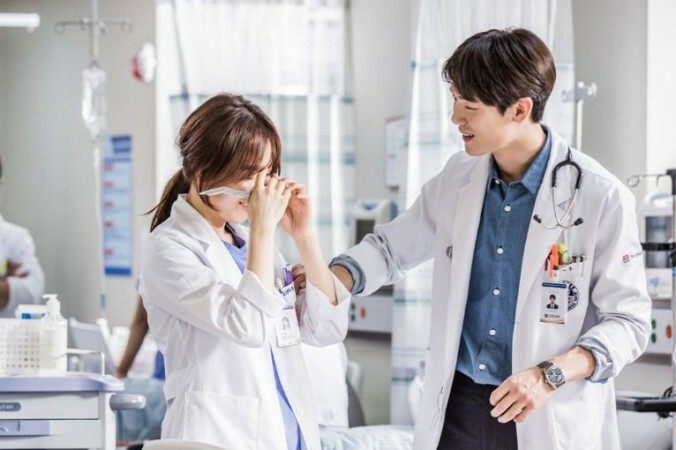 A drama with an amazing cast, a brilliant story line and endearing style of direction – we are already loving what we see with ‘Romantic Doctor, Teacher Kim‘. We will be watching out for this drama over the next month and hope to see brilliant results in it’s rating. What were your thoughts on the first two episodes of this drama? Were you satisfied? Shocked? Disappointed? Let us know in the comments below! Next articleIMFACT Is Back And It “Feel So Good”!